Hundreds of thousands of young fish and shellfish have been released into the waters across the nation, in the aim of rebuilding aquatic resources on the occasion of the traditional day of the Vietnam’s fishery sector which falls on April 1 (1959-2018). 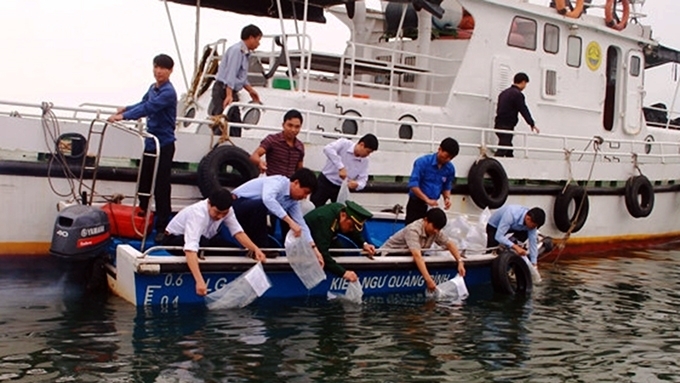 More than ten thousand aquatic species were released to the sea at the Cau Ngu Festival - a ceremony praying for a good fish harvest - on Cat Ba Island, the northern port city of Hai Phong on March 31. The event was jointly held by the Directorate of Fisheries, the Hai Phong Department of Agriculture and Rural Development and Cat Hai district. The festival attracted the participation of a large crowd of fishermen and tourists, praying for a good year with calm seas and bountiful catches. After the ceremony, they kickstarted the new catching season and released many breeds of fish to restore aquatic resources in the Cat Ba sea. At Ham Rong Bridge in Thanh Hoa province, local authorities dropped a tonne of freshwater fish into Ma River, while 50,000 shrimp breeds were released into the waters of Hoang Truong commune, Hoang Hoa district. 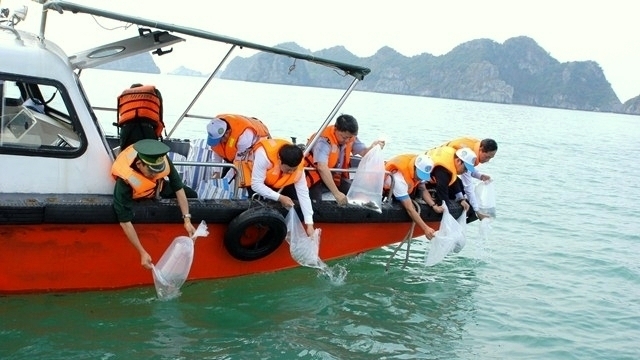 So far, this is the sixth year Thanh Hoa has hosted the event to release more than 17 tonnes of fingerlings and more than 4 million tonnes of shrimp into the natural environment. The same events were also held in Nhat Le River’s estuary in Quang Binh province and in the Nha Phu lagoon in Khanh Hoa province.